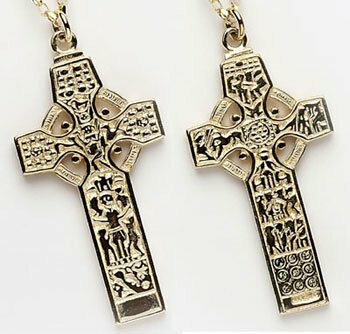 Beautiful Celtic Cross Pendant handmade in sterling silver or gold faithfully captures all authentic detail of the original cross of St. Patricks and Columba found at the Monastery in Kells, Co. Meath. 40mm high and 20mm wide. 7g silver weight. 8.4g gold weight. With 18 inch chain. This cross of St. Patrick and St. Columba is an authentic copy of the front and back faces of the original cross in Kells, County Meath. Columba founded a monastic settlement in Iona, an island off the coast of Scotland in 561. It was plundered repeatedly by Vikings and in 806 the surviving monks moved to kells. It was there that Ireland’s best collection of High Crosses was assembled. The Cross of Kells, like the other crosses, is weatherworn but it is still possible to discern its great beauty and unusal features. The scenes depicted in the panels of the cross are from the Old and New Testaments.